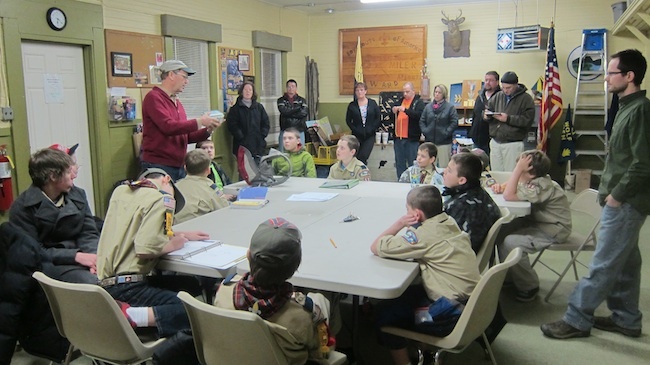 On Monday night, February 18, 2013, I had the pleasure to assist four other ham radio operators at Boy Scout Troop 68’s meeting in Laconia, NH. It was Show and Tell night, and the topic was amateur radio. Believe it or not, the Scout Troop has a very nice little ham shack equipped with a very swell HF radio. Chris Reynolds, KB1VXD, has a son in the troop, and invited other ham operators to come and talk about their experiences in amateur radio, what they like about it and what they might use. I brought in my Yaesu VX-7R handheld radio and compared it to a smartphone that I had in my pocket. The scouts immediately identified the phone and seemed to be impressed with how small the handheld radio was compared to the phone. The highlight of the night was a demonstration of morse code by Jim Cluett, W1PID and Johann Busch, W1JSB. The young boys were very attentive, respectful and well behaved, but I have a feeling much of what was said went over their heads. I say this because much of amateur radio is still over my head, and I’m not talking about the radio waves that constantly surround us! Jim Cluett, W1PID and Johann Busch, W1JSB collaborated on a very interesting demonstration of morse code. Jim split the group of boy scouts into two groups, and each group had to come up with their own secret message. Johann (Hanz) first transmitted his group’s message to Jim who successfully transcribed it. There was no doubt Jim would do this as he’s been a ham operator for 50 years, has taught morse code to countless people, and Hanz was one of his former students. 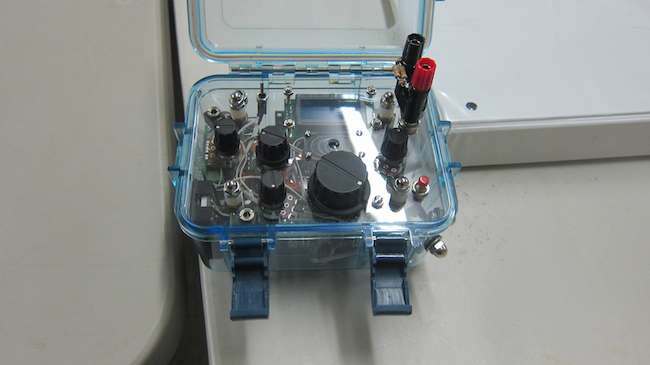 Hanz was using his very slick home-brew compact radio that is contained in a clear, waterproof case. He uses this radio to communicate with other hams across the world when he hikes, or is otherwise away from his ham shack. I was so jazzed by this radio I decided to build one myself. It’s unbelievable. To create the morse code tones, you simply have to touch the round nut(s) you see in the lower right corner of the outside of the case. Once Hanz’s message was deciphered, Jim had his boys came up with a message about skeletons and zombies. Jim used Hanz’s swell small radio and transmitted the di’s and dah’s to Hanz who expertly captured the sounds and magically made them into letters on paper for the boys to read. Watch the video for yourself. It was a fun night for all in attendance!